Hey Everybody! Mitch here! I just wanted to say ‘hey’, and let you know about some pretty exciting news! Erin and I are excited to be hitting the road once again, this time to Texas. We’ll be in Texas from Saturday, Ocober 13 through Sunday October 21. It’s been a while since we’ve been out that way, and we’re really looking forward to the visit. We’re surely going to look up some old friends, and we are really excited to make some new ones as well! We’ll be having a little ‘Bon Voyage’ sendoff at Commoner’s Brewing in Concord on Friday night, October 12. Saturday morning we’ll be off on the wings of man for a show at The Old Town Brewhouse in Lewisville, Texas on Saturday, October 13! This is our first time in this room, and we’re really excited about it. Next along the way will be the Carousel Lounge in Austin!! … with our good friends FlecHaus (you have to check them out!!) on Wednesday, October 17. It will be good to catch up with old friends and new! On Friday, October 19, we’ll be in Austin again, bringing the tunes this time to Austin’s Hyatt Regency – Marker 10 Lounge. 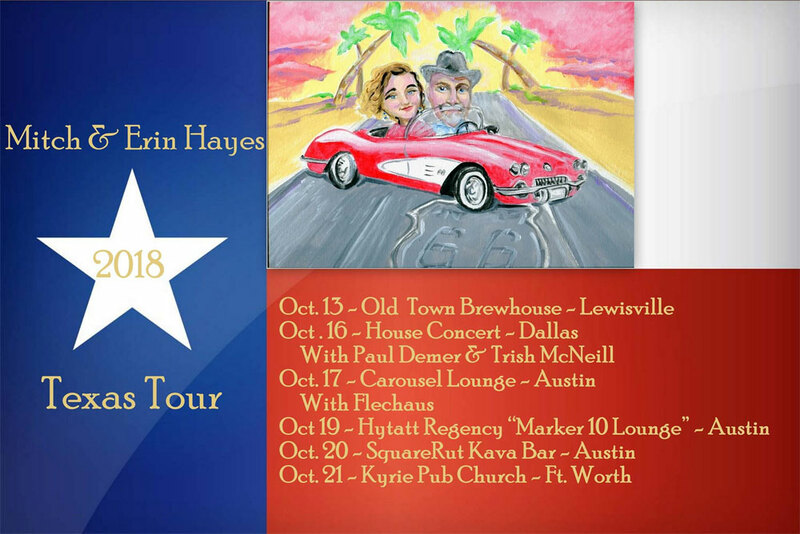 We’ll wrap up our Texas trip in grand fashion on Sunday, October 21 at the Kyrie Pub Church @ Chimera Brewing Company (Fort Brewery & Pizza) in Fort Worth. We’re looking forward to making lots of new and *very* interesting friends. If you’re in the area for one or more of these dates, please join us.